WoodBoxRadio has just recently released their Fxpad touchscreen software for PowerSDR. This is a program that allows you to use an off the shelf 7 inch usb touchscreen as a very nice looking external controller for PowerSDR. Fxpad provides you with a gorgeous multi purpose meter as well as buttons for commonly used functions within PowerSDR. The idea behind Fxpad is to allow your main PC screen to display your logging software or PSK31 software, while displaying information from PowerSDR on separate touch screen. This as would provide quick touch screen control over your SDR radio. Fxpad also a has a set of macro buttons to allow you to define your own commands sent to PowerSDR. Fxpad uses CAT commands to send and receive data from PowerSDR. You will have to setup and define a CAT port for PowerSDR using VSPmanager or com0com. If you are already using CAT for PowerSDR to control PTT for another program, you will have to use something like VSPE to split the serial port. Fxpad is primarily designed to be used in conjunction with WoodBoxSoftwares Tmate tuning control in mind. Even though WoodBoxRadio states that the software needs the Tmate controller to function properly, you really don’t need it for the software to work. There are a couple of display items that seem to be related directly to the Tmate, but this is relatively minor in regards to Fxpads function. If you use PowerSDRs spectrum display to tune PowerSDR, Fxpads display will update accordingly. This is a little counter productive to the spirit of having an external controller since you have to go back to your main display to tune. One work around is to use one of the 3D Connexion controllers for tuning since it will always tune PowerSDR whether the software has focus or not. Another thing to note, is that the Fxpad requires a touch display that can be set to 800 x 480 resolution. It will work on the iPad using the Air Display technique mentioned here, but will not fill the entire screen. You can download a trial for WoodBoxRadio if you want to check it out. You can get a feel for how the software works without a touchscreen by simply installing it and using your mouse to click on the buttons. WoodBoxRadio has done an excellent job with providing an attractive and useful controller for PowerSDR that looks great sitting on your shack operating desk. Fxpad software only is priced around $60 US. 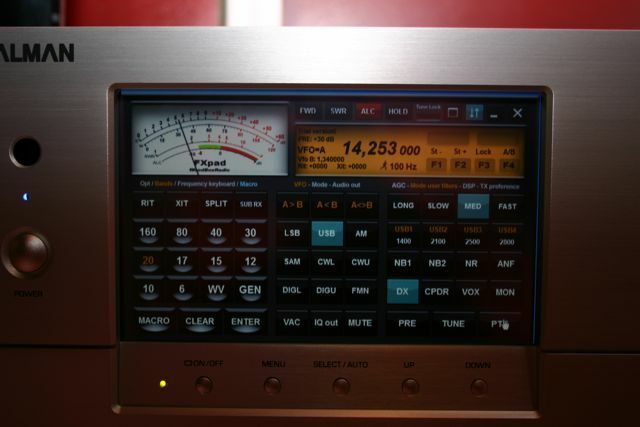 I like the idea of having a SDR that can be used like a classical TRX. So I bought such a HTPC and want to use it with the FXpad software. But how did you manage to let it fit into the screen? I always have a little gap above or below the FXpad window. I use Ultramon for fitting programs on oddball display sizes. Ultramon extends the resolution settings for displays that may not be natively supported by your video card. It would be worth downloading the trial to see if it works for you.